On August 3rd & 4th, I'm going to join 5,500+ cyclists for the 2-day, 190 mile bike ride from Sturbridge to Provincetown, MA., the Pan-Massachusetts-Challenge. This will be the 21st time that I've done this ride to raise money for the Dana-Farber Cancer Institute's Jimmy Fund. It's hard to believe that this one weekend event now accounts for over 50% of all funds raised by the Jimmy Fund and is Dana-Farber's single largest contributor. Last year, the effort raised $56 million! Since the ride began in 1980, this fundraising effort has raised an amazing $654 million to fund the fight against cancer. One of the reasons that this event can raise so much is that there's a minimum amount that each rider pledges to raise or pay him/herself. This year the minimum amount is $5,00. Over the last 20 years, I have raised over $110,000 and am aiming to add significantly to that amount this year with the goal of raising $13,000. I know that all of us have many charities that compete for our attention (and money). When choosing which ones to support, it's really important to look carefully at where your dollars actually go. 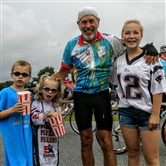 Since 2009, 100% of all funds raised by PMC riders has gone directly to the Jimmy Fund. Not one cent raised through the riders' sweat and determination was used for administrative and organizational expenses. The PMC is considered among the leanest of fundraising organizations in the nation today. This is an important cause and I'm asking for your support. This disease has affected my family and friends and those of you who have had personal experience with this horrible disease realize what it means to support the cause. I hope that you'll consider this worthy enough to sacrifice what it would take to go out for a nice dinner!